I was born 1981 in Duisburg, Germany, where I still live today with my wife and our three children. I'm a trained music dealer and I work as a salesman in a small music shop since 2000. Above all I am a believing christian and totally crazy about music. Around the age of ten I began to take a great interest in music and all kinds of instruments. Whenever we were visiting relatives or friends I was always eager to try out their pianos, keyboards or synthesizers. On my 12th birthday my parents gave me my first musical instrument: a Kawai keyboard FS-680. Over the years I learned to play keyboard and piano through the autodidactic way. I enjoyed really good music lessons at the secondary school. I am very thankful that our music teacher gave us intensive lessons in music theory and harmonics. That helped me a lot to understand music and to make great progress in learning to play my instruments. When I was 16 years old I began to play the bass guitar. The electric guitar followed when I was 18 and with my tight savings I bought my first effect pedal in a secondhand shop: a KORG ToneWorks AX30G multi effect unit. Now I was able to dive into the wonderful world of effects and this fascination for creating own sounds has not gone ever since. Already in the early '90s I got enthusiastic about synthesizers and the sounds they produce. The KORG workstation 01/W FD that a friend of my family bought new at that time instantly made me to a fan of that Japanese brand. On the basis of a Kawai 100F that a friend got for free out of his school's inventory I began to see the sonic and functional advantages of analog synthesizers. 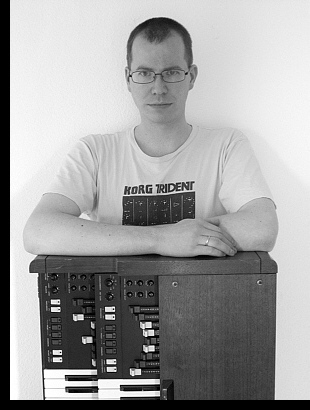 But it was not before 2004 that I was finally able to buy my first own synthesizers - a KORG Poly-61 und a DW-8000. It was no short-lived romance so I added various analog and digital synthesizers to my sonic palette over the years. I also use them live on stage. And I play all my keyboard instruments solely by hand without any help of sequencers or pre-programmed patterns. What you can hear in my recordings has been played by hand.